I loved soaring through Arkham City and reliving Batman’s past through Arkham Origins. 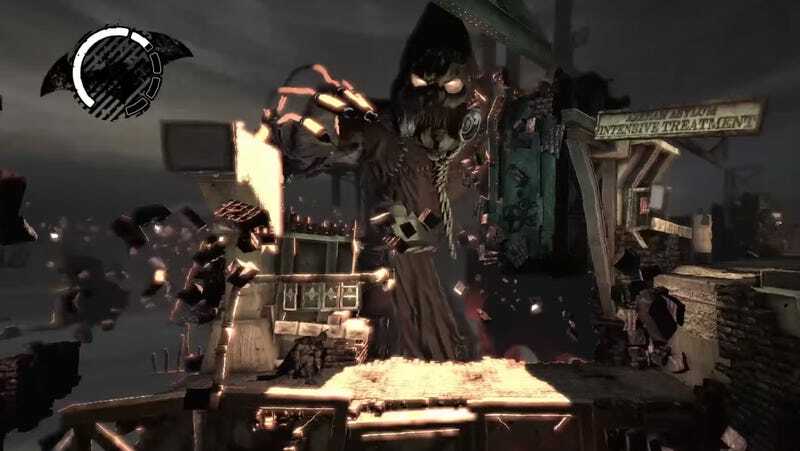 But Arkham Asylum still remains my favorite, in large part, because of the confrontation with Scarecrow. As part of my ongoing series examining some of my favorite levels in gaming, I want to delve into how Scarecrow’s nightmare sequences were a chilling and unique foray into the fractured psyche of Batman. The second of the scenarios seemingly comes true. Batman finds Commissioner Gordon, but he’s already dead. “I’m sorry Jim,” he laments. But we, the players, get a sense something is awry as the shadow of Scarecrow pops up behind Batman before quickly vanishing. The dark knight tries to call Barbara to tell her the sad news about her father, but is told the number he dialed isn’t available. The whole pathway to the Morgue starts to fall apart and bricks fall out of the walls. Roach-like blobs scatter and the sinister morgue is coldly empty when you enter. Batman turns around to exit back out to the hallway, but instead enters another Morgue room and starts hearing voices in his head (never a good sign). There are three body bags and the first he unzips is of his father. Scarecrow’s lights are blinding and deadly, leading to an immediate gameover if he spots you. Metaphorically, this seems to imply illumination is one of Batman’s greatest fears. Not about getting caught by Scarecrow, but exposing what he feels is his greatest sin. Failing his parents. He is a kid again, remembering what Jim Gordon had said to him after their death. He asks Gordon why his parents were killed, and Gordon, the face of authority, well-intentioned as he is, has no answer. That’s when he turns back into Batman again. It’s not an answer to his parent’s death. Rather, a reaction, trying to impose order and meaning into their meaningless deaths. When the players continues, Batman rises from his own grave, inside the nightmare again. There are multiple projections of Batman in a mad and deranged state. Another Batman is savagely eating a rat on the ground in a pose reminiscent of one of my favorite Dark Knight story arcs, Venom.